Dr Joseph will be backed by a bunch of talented and experienced musicians Nihal Jayawardena (Guitar /Saxophone/Harmonica), Sudesh Fernando (Piano /Keyboards), and Denver Barnes (Base Guitar). Isuru Senanayake (Acoustics Guitar-Percussion). The evening line up will include her original songs as well as some popular songs. Dr. Joseph, a consultant pathologist, believes in a life of service and significance and not in a mere circumstantial existence or a preoccupation with the usual mundane concerns of the professional classes. This is reflected in her attitude to her work and to her music. Nurtured in western popular music at home and light classical music in school she went on to sing Sinhala songs composed by Clarence Wijeywardene as the leader of the Winslow Six along with her five siblings. She now focuses on a solo career. 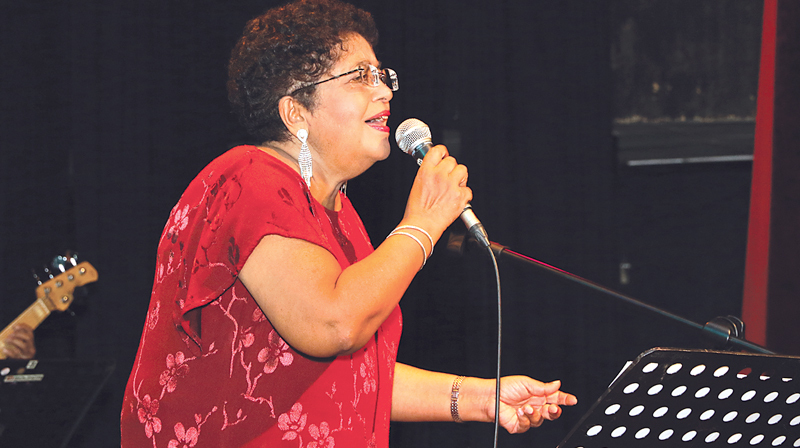 Dr. Joseph is a prolific songwriter and lyricist in both English and Sinhala, having 30 original songs to her credit some of which have been composed in her teens. These range from songs about aspects of love – romantic love, disappointment, unrequited love and about burning social issues and philosophical and spiritual matters, as well as filial love and gratitude to one’s parents. Some of these songs have been inspired by her own experiences, some by those around her. English is the lingua franca and music itself is a universal language. One can reach out to many through English songs. It can also bond and bind many ethnicities in a country like ours’ she says. She maintains her Sri Lankan identity even in the musical arrangements. Dr. Joseph believes that the 60’s and early 70’s were the golden age for popular music because there were fewer conflicts in the world then, less anxiety and more hope and this fact was demonstrated in the songs of that time which were lighthearted and sentimental exemplifying the values of that period and the uncomplicated relationships which existed between men and women.